★Ultra Bright: True 800 lumens light output from the Powerful LED Chip that emits bright light over the length of seven basketball fields (643ft/196m) and reach over 656ft. Features 5 useful modes: High/Medium/Low/Strobe/SOS. Adjustable Focus: Adjust the focus for different use, fully zoomable from wide to narrow beam for versatile illumination. Long Lasting: Up to Max 4hrs of illumination from the included premium rechargeable 26650 battery with protected integrated PIC design. High quality LED delivers consistent, optimum performance throughout 50,000 hours of usage. Tough & Reliable: IP65-rated water resistant and designed for use in heavy rain. Its durable aircraft grade aluminum body with military grade hard-anodized clip slot endure rough handling. 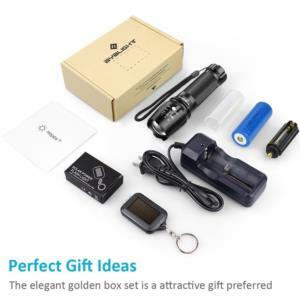 Risk-Free Purchase: You get BYBLIGHT led Flashlight, 26650 Rechargeable Battery (Pre-load), AC Charger, wrist strap, user manual, and our worry-free 18-month warranty and friendly customer service. Why You Need a Tactical Flashlight? There’s a particular way you want to maneuver in a dark space when using your flashlight to maximize your safety! There are thousands of flashlight modes on the market, the one you choose will typically come down to your budget and personal preference. our Tactical Flashlight has no doubt to get the job with its 800 lumens output, it also can be used for camping or any other normal lighting! it is easy to grip with the provided lanyard protected! Considering you will carry the flashlight in your pocket every day, its size is smaller than the size of your palm. Good for EDC! it won’t be broken easily but very energy efficient compare with the competitor! 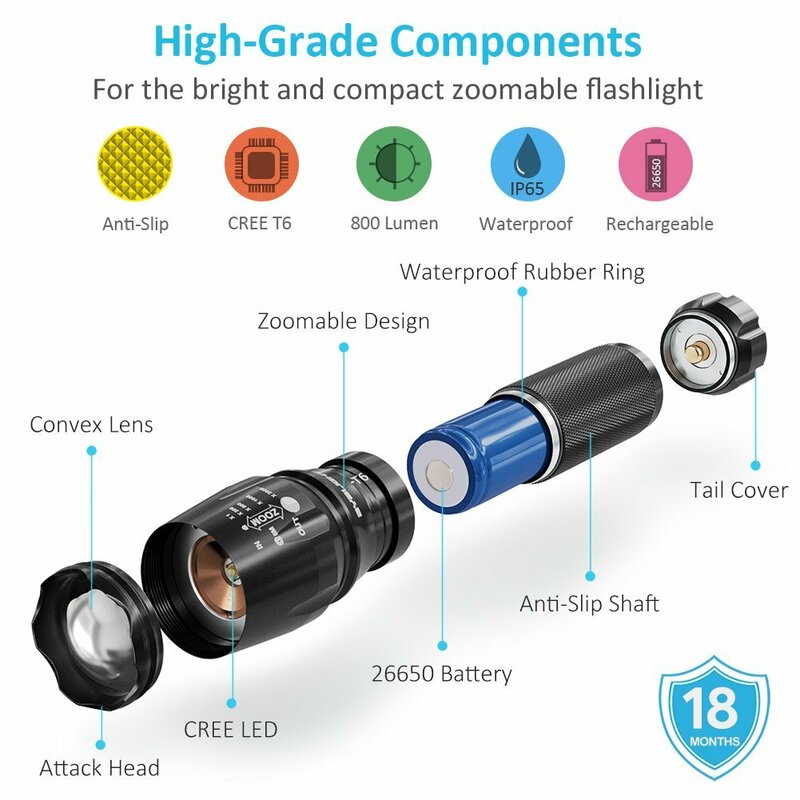 You can use the flashlight in any other wet conditions, even in the heavy rain thanks to the high rated water resistant! high, medium, low, strobe and SOS signaling features with simple button to control as well as the Adjustable Focus on distant objects! So this is a 4 pack? 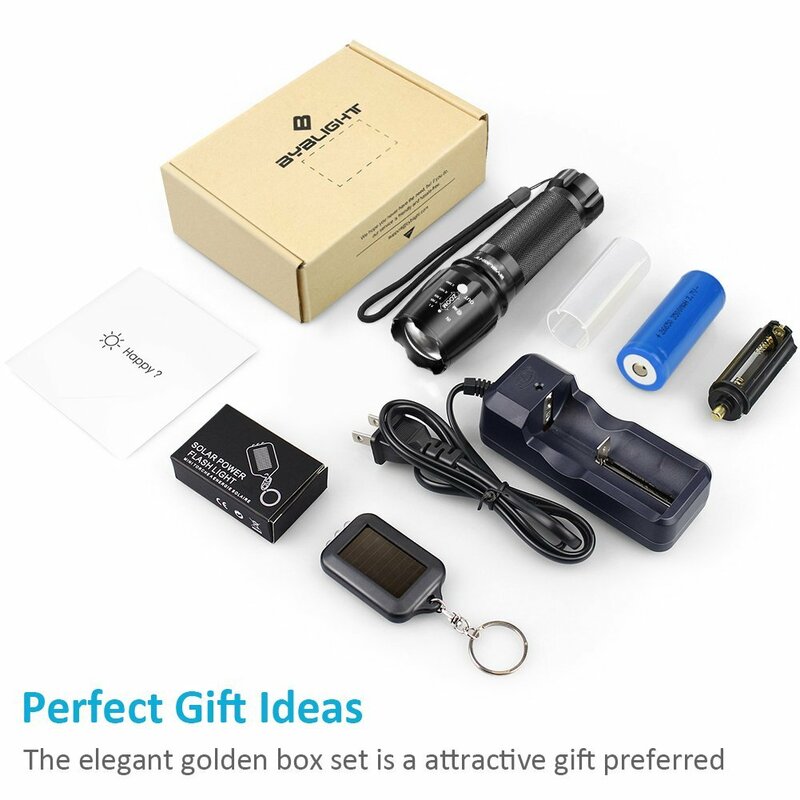 Includes: 1-Flashlight, 2-High capacity rechargeable battery, 3-Sleeve adapter for medium capacity battery (battery not included), 4-Charger and 5-Adapter for AAA batteries. Hope this helps. Buy it, its a great deal and product. 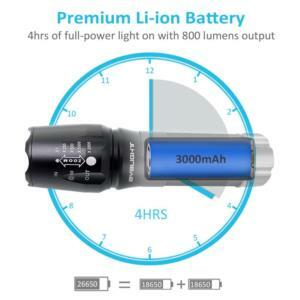 Has anyone tested the lumen output? I find the claim of 700 lumens to be rather dubious. This one actually claims to be 800 Lumen. I don't have a meter, but I do have several standard interior light bulbs made by Feit, that also claim to be 800 lumen, and this flashlight is far brighter. Of course the flashlight has a focused beam, so who knows, but it's bright as hell. What is the diameter where your hand fits around? My hands are small and I can fit them all around it handle. Satisfied, will buy their products again! This is an update to my original review, which was negative because I received a defective product. However, BYB light immediately contacted me to resolve the issue. They sent me a good product, and I must say that I am satisfied with the light. I realized that as long as the human element is present, some products are bound to fail. 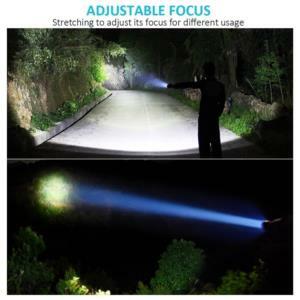 The new product that I received work very well, that little flashlight packs a punch! Infact, it is the brightest flashlight I've ever owned. But even more impressive than the flashlight, I was amazed how fast BYB light addressed my concerns and respved the issue. That just shows that we are dealing with a company who stands behind their products and services... and that.to me..... Is an award in itself! Thank you Susan at BYB for standing behind your products and services! Super bright and well built flashlight with great extras! This is a seriously bright flashlight. I do not have a way to verify that it is actually 800 lumens, but I can say that it is the brightest flashlight I have ever used! When I used it at night it was as bright as daylight, and during the day the light is still very visible. I can even see the light during the day when it is pointed at my light in the house. The light’s beam is focusable with a cool sliding mechanism – the lens of the light is able to be slid in an out. When it is all the way in it illuminates a very large area, and when you slide it all the way out it focuses the beam into an extremely bright square. 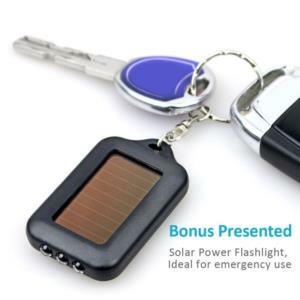 This flashlight comes with great extras – a 26650 lithium-ion battery, a charger which charges the included lithium-ion battery as well as any lithium-ion battery (it is universal and the contact slides to fit the battery), as well as a solar powered LED keychain light. The battery charger is awesome – I had actually recently bought a lithium-ion battery charger which cost a few dollars, but the charger that is included with this flashlight works much better than the one I purchased elsewhere. The included charger has a LED indicator which turns red when the battery is charging and green when it is completely charged. It also comes with a battery holder which allows you to fill the flashlight with AAA batteries. 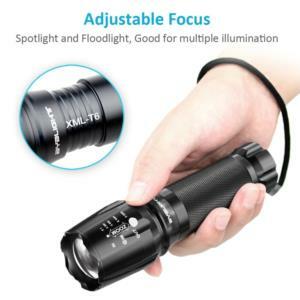 I have not tried the flashlight with AAA batteries because the rechargeable lithium-ion batteries are much better and save money. The flashlight itself is built very well with all aluminum outside. The sliding mechanism feels very solid and holds the adjustment, yet it is still easy to slide. The power button on the back is rubberized, and the same button which is used to turn the light on and off is used to change the mode (high brightness, medium brightness, low brightness, strobe, SOS flash). When you press the button fully it turns the light on/off, and when you depress the button halfway it changes the mode. The light does not have a memory of the mode when turned off then on again; when the flashlight is turned on the mode is reset to high brightness. When I took the flashlight out of the box I tried it before charging the battery, and while the light turned on, changing the mode was difficult and took a few seconds. I put the battery on the charger, and it took around 8 hours for it to fully charge – after the battery charged I tried again and the light was much brighter and changing modes was very easy. So, if you are having a problem with a delay in changing modes make sure you have charged the battery! Disclaimer: I received this product discounted in exchange for my honest and unbiased review. I am disclosing this in accordance with the Amazon Guidelines and the Federal Trade Commission’s 16 CFR, Part 255: Guides Concerning the Use of Endorsements and Testimonials in Advertising. I am not affiliated with the seller or company and make no promises of a good rating while reviewing the product. I test thoroughly and do my best to provide detailed reviews to other customers so they may make informed decisions. If you have any questions please feel free to leave a comment and I will get back to you as soon as possible. When I purchased this flashlight, I read the reviews for this flashlight, and many others like it; many costing much more than this one. I figured the low price was worth the gamble. The flashlight arrived in the time estimated. I am a correctional officer, so having a good reliable flashlight is important to have on hand. The one I purchased from a local tactical store just wasn't cutting it when it came to reliability, or brightness. I found myself smacking the thing to make it work. The day I got this, I charged the 18650 right away, and once it was charged, threw it in the flashlight. Neither the charger nor the battery got hot during the charging. The battery fits well in the flashlight... it doesn't rattle inside, and when I need to get the battery out, I just unscrew the back end, tilt it back, and the battery falls out. Everything fits together fine. I don’t use the special strobe effects on it, so I can’t comment on my thought on selecting those features, I just click the thing normally and the light comes on and off as needed. The flashlight is nice and heavy. It feels well put together, performs well, and fits great in my hand. The light if very bright and white. Unlike my previous flashlight, it’s always worked when I needed it. I have never used the AAA adapter. It’s still in the box on my dresser. The complete package, with all the features you'll want and more. I read and compared reviews for these things until my head was spinning. Eventually I settled for this one, and I have no regrets. No doubt most tactical flashlights in this general price range are more or less the same, with the possible exception of some high-end (and high-priced) ones made in the US (all the others are made in you-know-where). 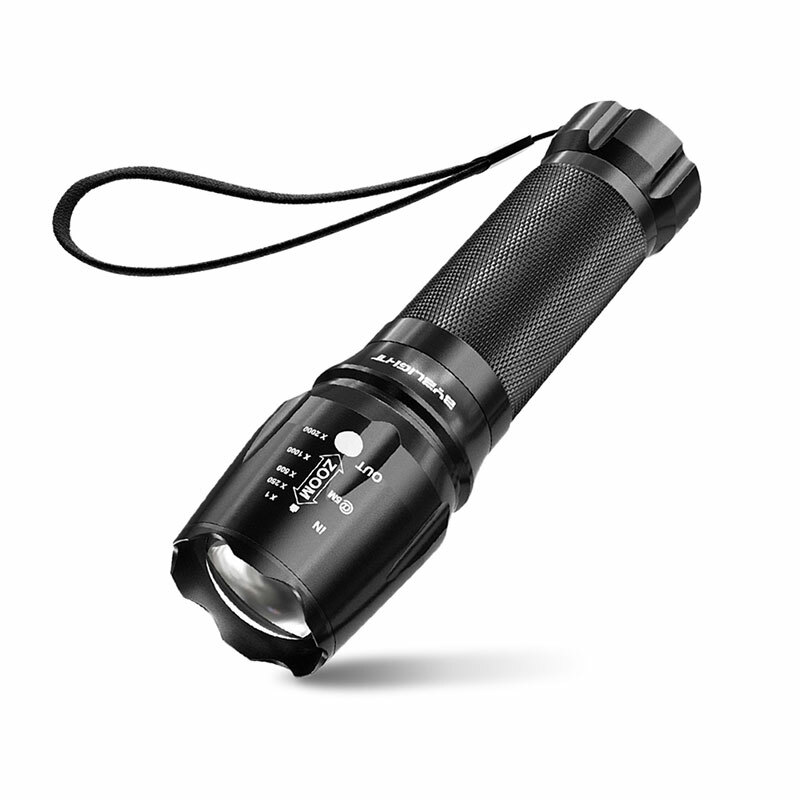 The BYB 800 functions perfectly, feels heavy and solid, nothing rattles or jiggles, and above all, it's as blindingly bright as you'd expect from this kind of flashlight. The included solar-powered keychain light is actually a nicer bonus than I would have thought—also very bright, and great for keeping on your night table for shuffling through dark bedrooms.